G-protein-coupled receptors (GPCRs) represent a very large superfamily of receptors that are critical for signaling of a diverse group of ligands to heterotrimeric G proteins . At least 30% of predicted potential drug targets are GPCRs . Ligands for these receptors include light, odorants, tastes, small-molecule neurotransmitters, peptides, glycoprotein hormones, proteases, and others. GPCRs are composed of seven transmembrane segments, with an extracellular amino terminus and a cytoplasmic carboxy terminus. In the class A, rhodopsin-like GPCRs, the binding pocket is formed among the transmembrane segments and/or extracellular loops. 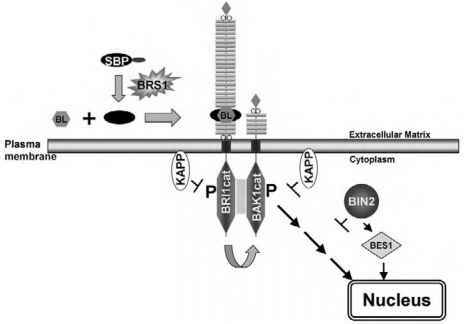 The role of these receptors, as for all GPCRs, is to transmit a conformational change induced by extracellular signaling molecules from the ligand-binding pocket via the transmembrane segments to the cytoplasmic surface of the receptor and subsequently to the G protein. The conformational change produced by agonist binding facilitates the interaction of the receptor with G protein and the subsequent exchange of guanosine diphosphate (GDP) for guanosine triphosphate (GTP), which results in dissociation of the G-protein heterotrimer to form activated Ga and GPy. Despite an enormous amount of research on the structure and function of these receptors, until very recently no highresolution structure of any GPCR was available. In 2000, the crystal structure of bovine rhodopsin was determined to 2.8 A . Based on an analysis of the consistency of previous data from a number of different GPCRs with the structure of rhodopsin, we have inferred that the overall structures of rhodopsin and of class A receptors are very similar, although we also identified localized regions where the structure of these receptors may diverge . We further proposed that several of the unusual bends and twists in the transmembrane segments (TMs) of rhodopsin are also present in other GPCRs, despite the absence of amino acids that might have been thought to be critical to the adoption of these features. Thus, different amino acids or alternative microdomains can support similar deviations from regular a-helical structure, thereby resulting in similar tertiary structure. Such structural mimicry may be a mechanism by which a common ancestor could diverge sufficiently to develop the selectivity necessary to interact with diverse signals, while still maintaining a similar overall fold. The shared three-dimensional architecture of different class A GPCRs suggests that they may also share the basic mechanisms of ligand-induced conforma-tional change. Thus, although there is no logical necessity that all GPCRs use the same cognate amino acid positions to bind ligand , as discussed below, it seems likely that many indeed do so. With hundreds of class A receptors and more than 700 GPCRs in the human genome alone, it is important to develop a language and nomenclature that can allow scientists studying different receptors to communicate. To facilitate the comparison of aligned residues in different GPCRs, we use and advocate the indexing method introduced by Ballesteros and Weinstein , in which the most conserved residue in each transmembrane segment (TM) is given the index number 50. Thus, for example, the Arg in the highly conserved (E/D)RY sequence at the cytoplasmic end of TM3 is Arg3 50, and the other residues in TM3 are indexed relative to this position, with the preceding Asp3 49 and the subsequent Tyr351. This method, which counts from the most conserved position rather than from inexact inferences of the beginning of the TMs, facilitates comparison among different GPCRs. Arg3 50 now takes on significant meaning in any GPCR, and Arg1313 50 in the p2-adrenergic receptor (AR) identifies not only the absolute residue number in the p2-AR sequence but also the position of the aligned residue in other GPCRs. In contrast, unless one's research focuses on these receptors, for example, Arg131 in the human p2-AR or Arg 135 in bovine rhodopsin or Arg519 in the human thyrotropin receptor are meaningless residue numbers without reference to a multiple alignment and much counting of residues. The index residues in each of the TMs of bovine rhodopsin are Asn551 50, Asp83250, Arg1353 50, Trp161450, Pro2155 50, Pro26 7 6 50, and Pro3037 50 (Fig. 1). All of these are highly conserved in aminergic receptors and rhodopsins and therefore allow unambiguous alignment of the TMs of these receptors. Figure 1 Helical net representation depicting the relative positions of the residues in the transmembrane domain of rhodopsin and the indexing system. 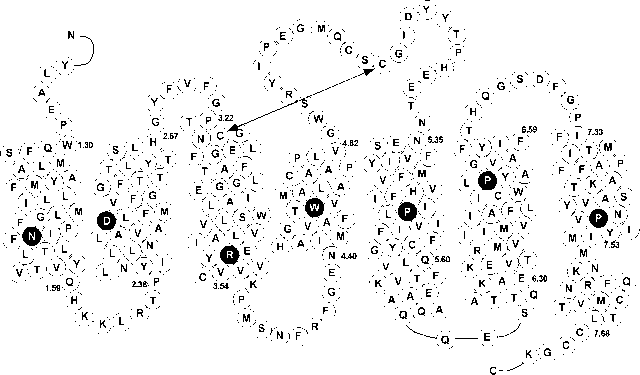 The helix ends are shown as per the rhodopsin structure. TM1 is from index 1.30 (rhodopsin residue 35) to 1.59 (64), TM2 is from 2.38 (71) to 2.67 (100), TM3 is from 3.22 (107) to 3.54 (139), TM4 is from 4.38 (149) to 4.62 (173), TM5 is from 5.35 (200) to 5.60 (225), TM6 is from 6.30 (247) to 6.60 (277), and TM7 is from 7.33 (286) to 7.54 (307). The most conserved residue in each TM is Asn551 50, Asp832 50, Arg1353 50, Trp1614 50, Pro2155 50, Pro26 7 6 50, and Pro303750. Their single letter codes are shown in white on filled black circles. Residues at the cytoplasmic ends of TM5, TM6, and TM7 predicted by spin-labeling studies to be in an a-helical conformation but which are not in an a-helical conformation in the rhodopsin structure are shown with dotted circles (4). Note: Receptor names are abbreviated according to their SWISS-PROT Annotated Protein Sequence Database entry names: http://www.expasy.ch/cgi-bin/lists?7tmrlist.text. Ser186-Ile189 forms 04 in E2 (see text). Residue indexing: To facilitate comparison of aligned residues in related GPCRs, the most conserved residue in TMX is given the index number X.50, and residues within a given TM are then indexed relative to the "50" position . The most highly conserved residues in this family are indicated in Fig. 3 in an alignment of rhodopsin with a selected group of class A GPCRs. (Note that the "50" position does not require the residue to be in the middle of the TM; for example, the highly conserved Arg350 is at the cytoplasmic end of TM3 in the conserved E/D-R-Y sequence.). aThe calculation is based on chain A of the refined bovine rhodopsin structure (PDB code 1HZX). NR, the SASA is calculated without retinal; WR, the SASA is calculated with retinal; A, the difference between NR and WR. The values shown are the surface area of each residue that is exposed to solvent. bProtected residues in D2 receptor SCAM experiments [14,23-26]. 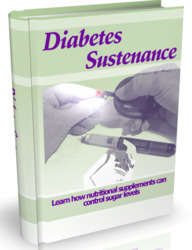 cAccessible but protection not tested due to small effect size . Source: Adapted from Table 3 of Ballesteros, J. et al., Mol. Pharmacol. 60, 1-19, 2001, which contains the references for the studies in the representative receptors, except for 3.40 [27,28] and 4.56 [29,30]. note that, in the dark, retinal is an inverse agonist, a particular type of antagonist that stabilizes the inactive state of the receptor and contributes to the very low constitutive activity of rhodopsin in the dark (see Chapter 22). Upon photoisomerization by light, retinal adopts a different configuration in the binding pocket and becomes an agonist. The high-resolution rhodopsin structure was obtained in the dark in an inactive state, and because there is no highresolution active structure, the conformational changes involved in receptor activation have been studied using indirect methods. Figure 2 Schematic three-dimensional representations of the bovine rhodopsin structure. The 7 a-helical TMs are shown as green ribbons. The P-strands in the extracellular domain are indicated by large strand arrows. The positions of the residues that are in direct contact with the ligand retinal are colored yellow. The left panel shows a side view, and the right panel shows an extracellular view of the 7 a-helical TMs and E2, but with the amino terminus, E1, and E3 removed. directly with catecholamine agonists. These residues include Asp113332, which interacts with the protonated amine of biogenic amines; Ser203542, Ser204543, and Ser207546, which interact with the meta-OH and para-OH of catecholamines; Asn293655, which interacts with the P-OH of epinephrine; and Phe208547, Trp286648, Phe289651, and Phe290652, which form a cluster of aromatic residues in TM5 and TM6 that interact with the aromatic ring of ligands. Even without modification of the rhodopsin backbone, it is clear that epinephrine fits remarkably well within the binding site formed by these critical residues. In Fig. 3C, we illustrate a P2-AR antagonist affinity label, docked within the TMs of the rhodopsin structure, with all the residues from Table 1 mutated to the aligned P2-AR residues. 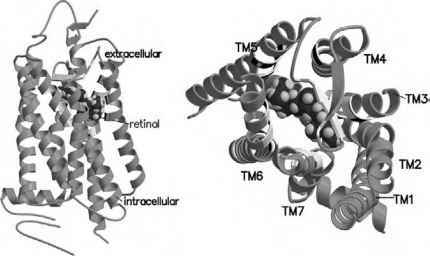 Again, the ligand is bound to essentially an overlapping set of the residues that contact retinal in rhodopsin. It is important to note that, although some of the residues in the binding-site crevice of these receptors are conserved, most are not. Thus, these residues have apparently evolved to impart specificity within a certain receptor. Consequently, what is "conserved" among these receptors are the positions of the residues involved in ligand binding and thus the particular surface that serves the role of ligand binding. It seems likely that many, although certainly not all, GPCRs will share similar locations of their binding pockets. Indeed, although peptide ligands bind to extracellular loops, at least in certain cases, there is also evidence that parts of peptides dip down into the transmembrane domain and contact some of the same positions found to be critical for binding to rhodopsin and the aminergic GPCRs [7-9]. It is likely, however, that structurally dissimilar ligands bind to some extent in different orientations, and these modes of binding can be extremely difficult to predict .